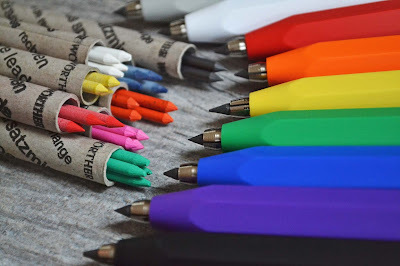 Founded in 1985 by Gerhard Wörther (a specialist in mechanical engineering), the WÖRTHER BADEN-BADEN company manufactures exceptional mechanical pencils, writing instruments and accessories. Every writing instrument is manufactured in house, in Baden-Baden, a small town in southwestern Germany. Wörther prides itself on quality and design. To ensure the highest precision in their products, Wörther has even developed and built some of their own machines for production. One of Wörther's best selling products is the Shorty pencil. 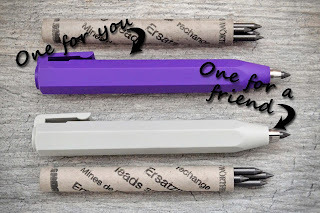 The Shorty gets its name from its 4-1/4" length - short compared to a standard writing instrument, but long enough to comfortably fit in your hand. The rugged plastic barrel has a hexagon shape, and is 1/2" in diameter. The shape of the Shorty provides excellent grip and comfort, and the size and light weight is just right to eliminate hand fatigue. The lead is easily advanced or retracted with the push button spring clutch mechanism. Every Shorty comes with 2 spare 7B graphite leads! The Wörther Shorty is quipped with an incredibly smooth, 7B graphite lead, 3.15 mm in diameter. The leads are approximately 2-3/4" (70 mm) long, which provides hours of endless writing and sketching per stick. The 3.15 lead is a perfect size. 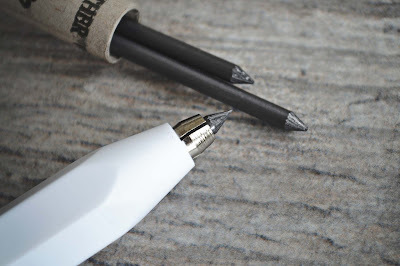 There is no fuss with sharpening the point - simply changing the angle of the pencil will allow you to achieve sharp thin lines for detail, or smooth wide lines for shading. Wörther offers 8 colors of 3.15 leads - yellow, green, white, pink, blue, orange, red, and 7B graphite black. 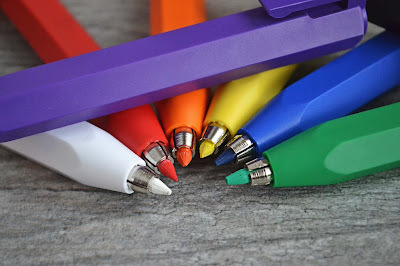 Equip your Shorty with a colored lead to turn it from sketch pencil, to a really cool colored pencil. The smooth leads are highly saturated with color. The leads can write on almost all materials, including wood, metal, paper, plastic, glass (using red lead), or x-rays (using white lead). thick 7B graphite, but it can be easily swapped out for colored lead. With the Shorty, Wörther has designed the perfect sketch pencil. The combination of the simple and reliable mechanism, the comfortable shape and light weight, and Wörther's soft and smooth leads make the Shorty an ideal pencil for drawing, designing, sketching and everyday use. Want to win a Shorty for you and a friend? Head over to our Instagram to find out how to win! Giveaway ends November 2, 2018.